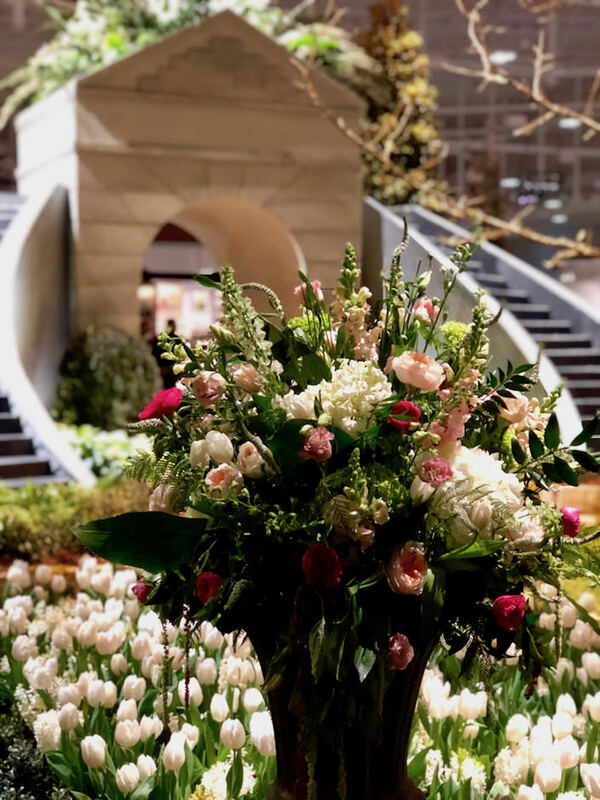 Setting the tone with drama and finesse, the elegant entrance display, above, was designed and executed by Cheekwood, the local botanical garden and art museum, that is a beneficiary of the show. While it is an enormous show and we had a busy agenda, I managed to capture a few favorites. 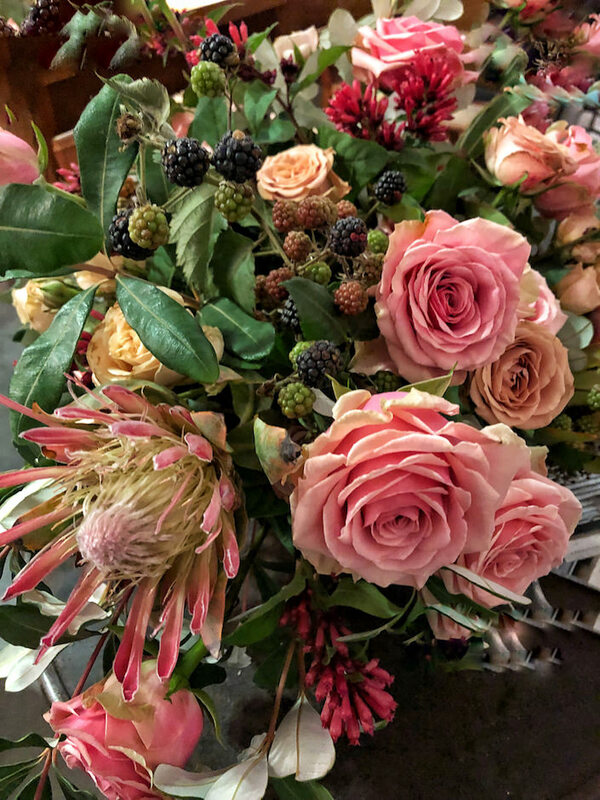 Jeannette Whitson of Garden Variety Design was back this year to everyone’s delight. 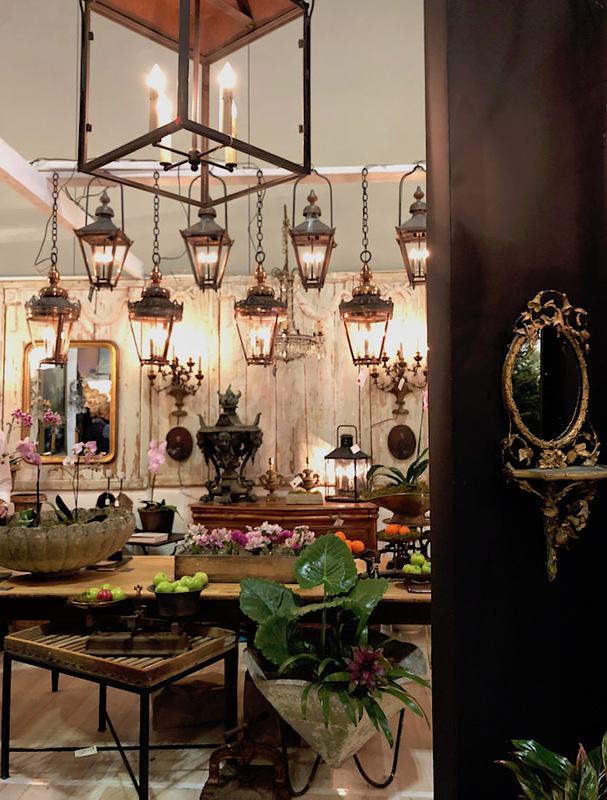 Her booth was brimming with temptation such as the vignette above including sparkling Baguès sconces, a rustic flamingo and old rose velvet covered bergères. 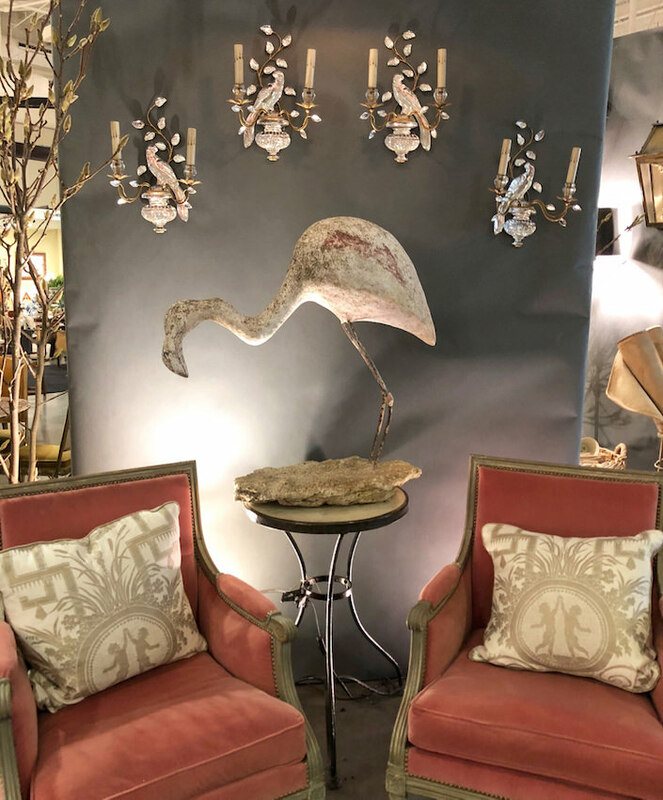 Jeannette’s seasoned eye assembles such interesting and eclectic arrangements, frequently featuring bird and nature inspired motifs. 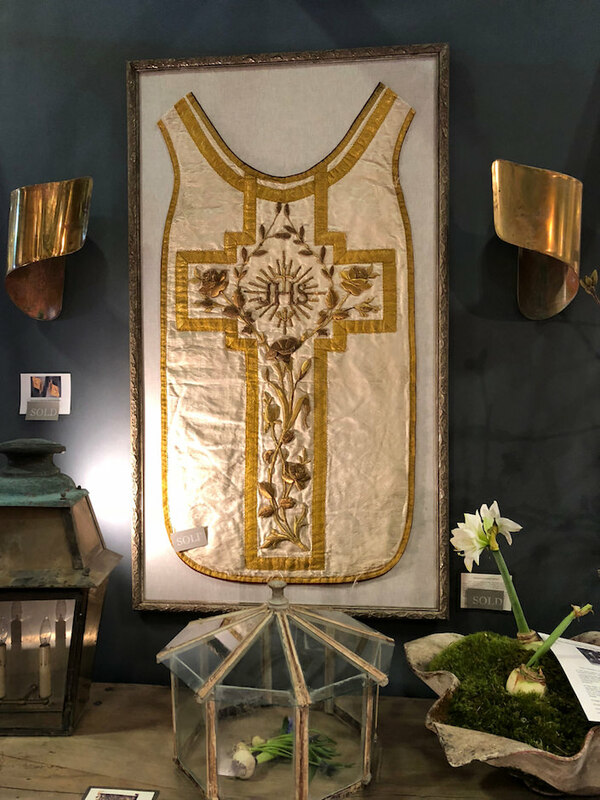 Below an unlikely yet interesting pairing of a framed 18th century gold silk ecclesiastical vestment with custom designed brass sconces that are featured in Jeannette’s stylish studio. with backs in the original moiré. 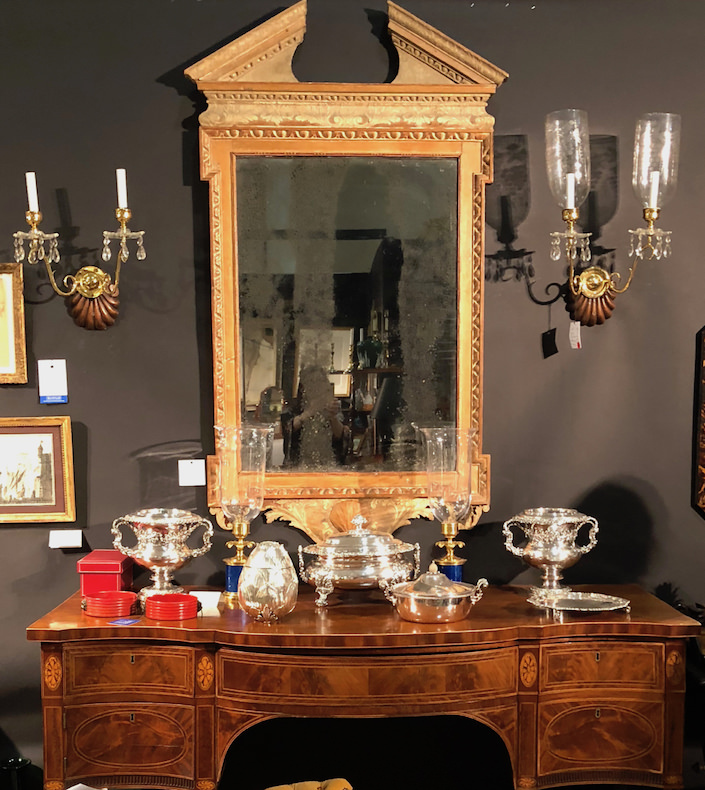 James Sansum is a dealer whose understated demeanor belies his refined taste and impeccable offerings. 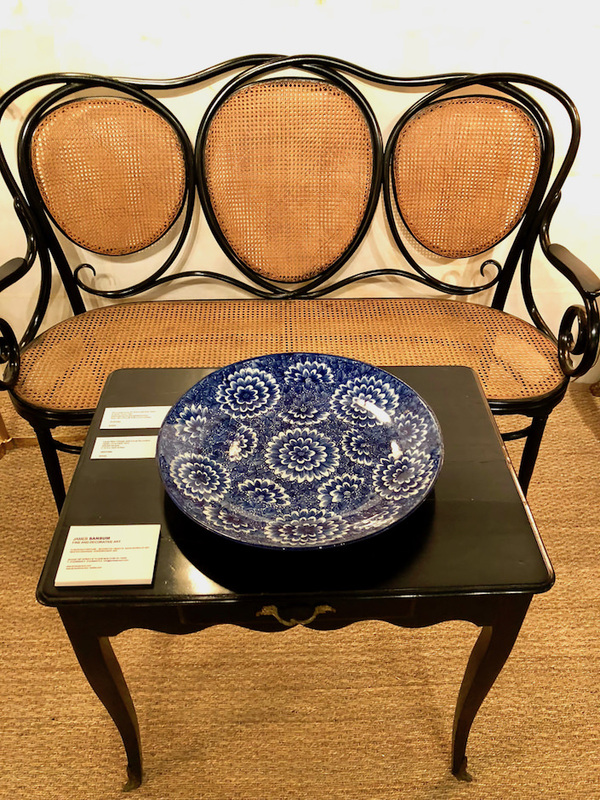 Below, a sinuous 19th c. Thonet bentwood bench and large circa 1900-10 Meiji floral charger on a provincial Louis XV (c. 1760) ebonized side table. This painting, by an under-the-radar early 20th c. American painter is a gem. Edward Bright Bruce was a NYC lawyer and successful publisher which allowed him to retire early. With a lifelong love of painting and art collecting, he moved to Italy to study. 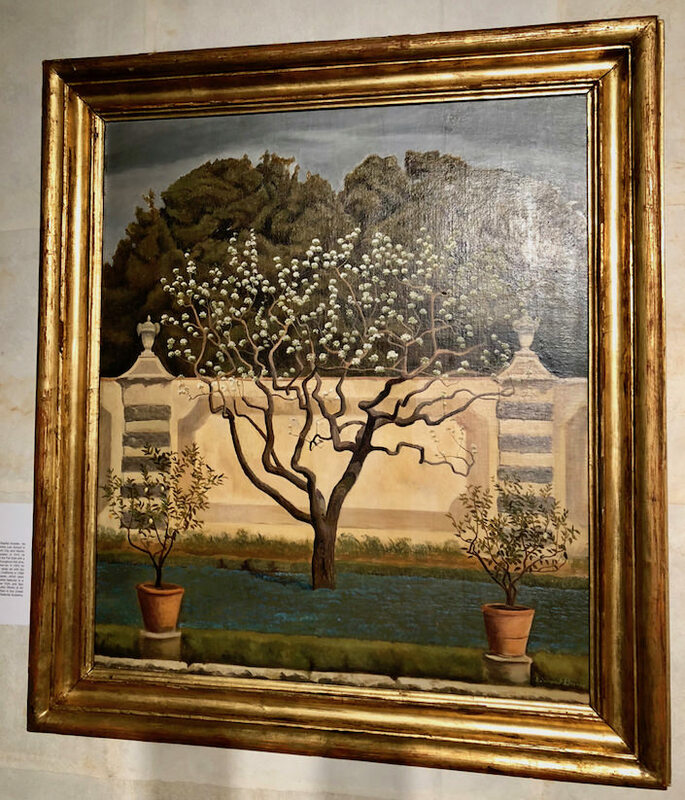 “An Italian Garden” is from this period. 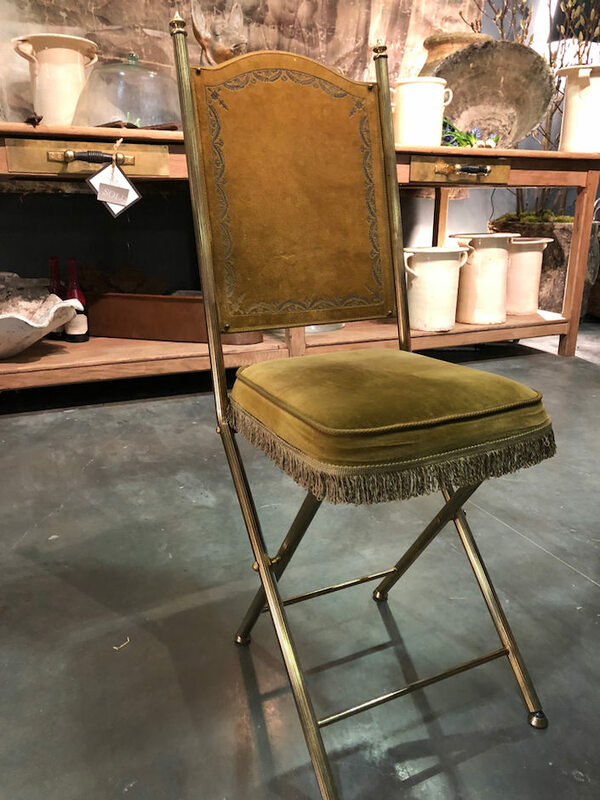 James has a pair of these handsome Louise XVI fauteuils by Pierre Bernard c. 1780. 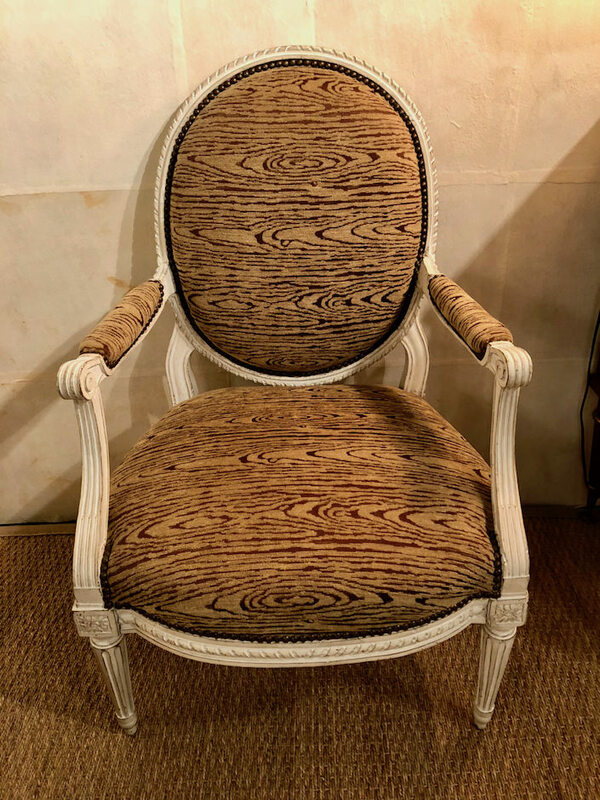 Having a decorator in the family is very convenient as partner, designer Markham Roberts chicly upholstered them with the reverse side of Carleton V’s Iroquois. 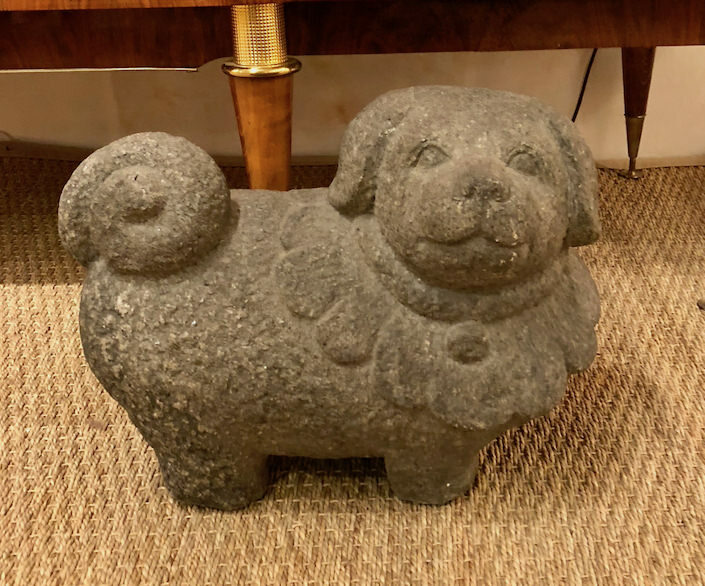 The one item James said would be particularly difficult for him to part with is this rare Japanese Edo dog sculpture. With its charming expression and adorable stout stature, I can totally understand. 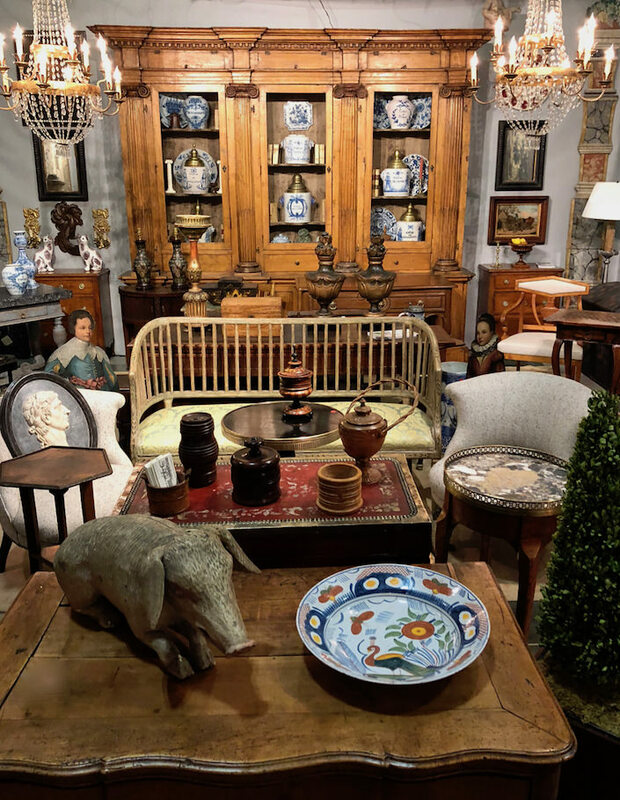 Lynda Willauer is a wonderful dealer I am familiar with from Nantucket. 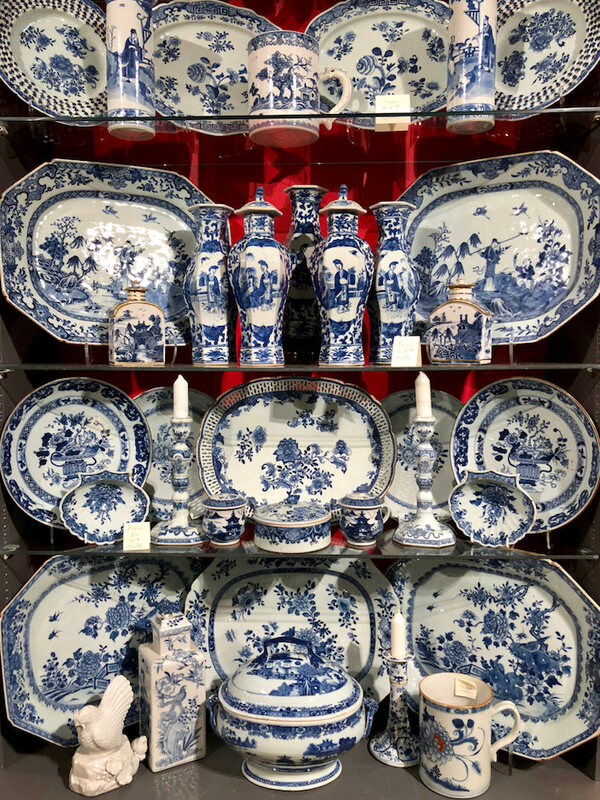 She had an enormous display including copious amounts of blue and white Chinese export. 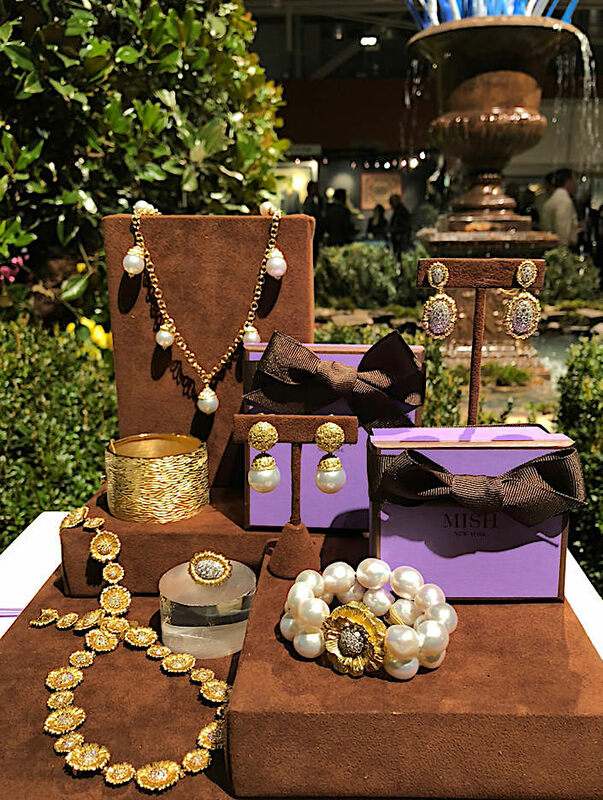 Caroline Faison is another perennial participant whose booth is always an attraction. 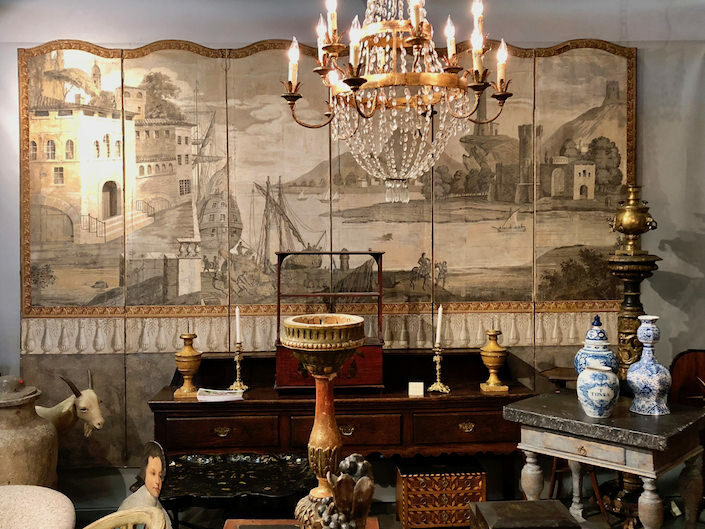 This fantastic Zuber wallpaper screen, at over 10 feet long and 8 feet high, would be a marvelous backdrop for any room. 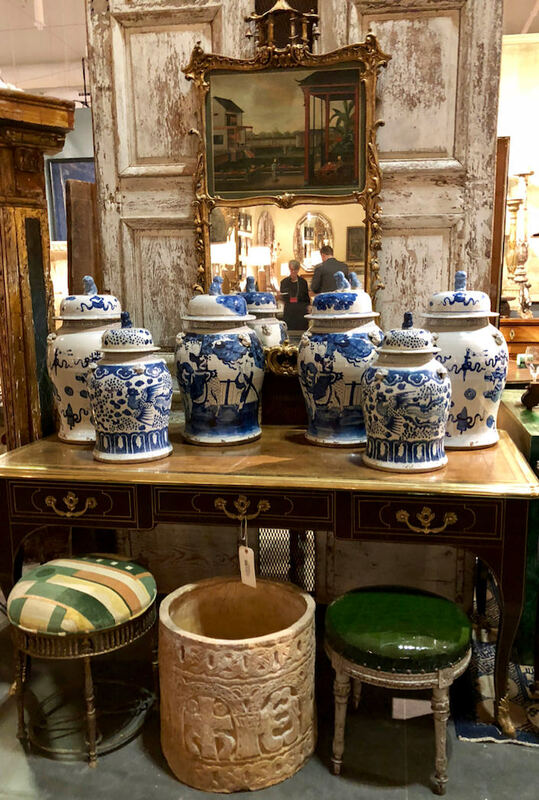 More blue and white, a great chinoiserie mirror and some charming stools were at Charles Hanlon’s Mayfair Designs, below. 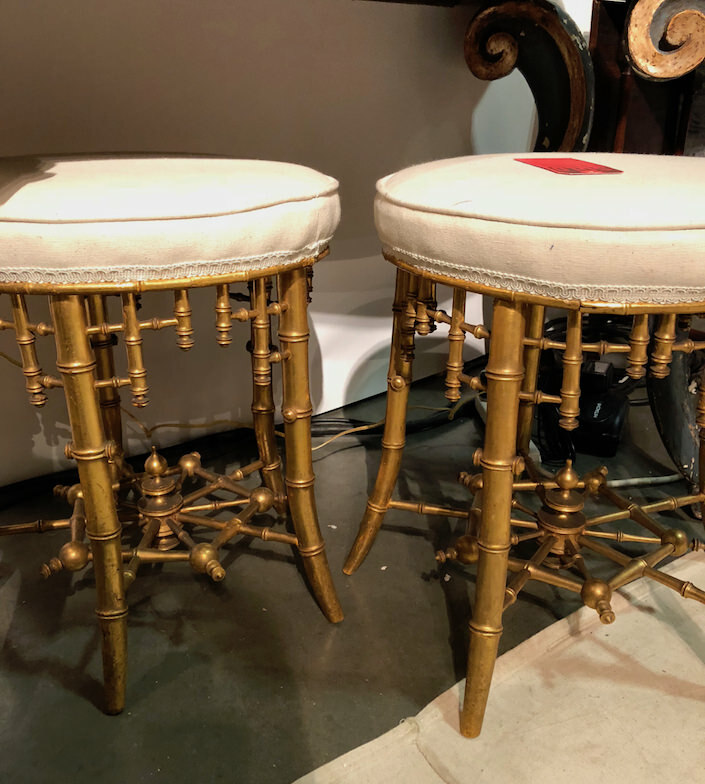 And Susanna was disappointed to see that this pair of chinoiserie faux bamboo stools were already sold at Kevin Perry. 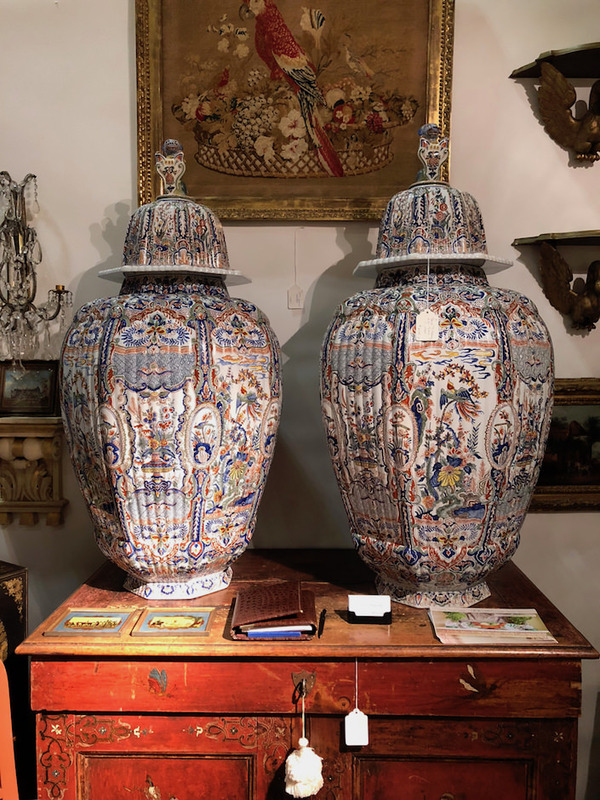 He also had these fabulous large and decorative ginger jars that I was surprised to learn were from Tiffany’s circa 1960. 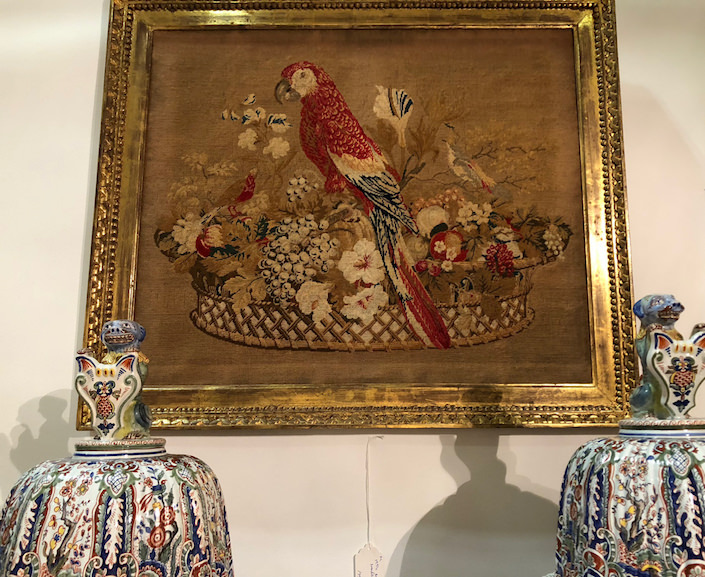 Above them was a charming 19th century macaw needlepoint in a pretty gilded frame. 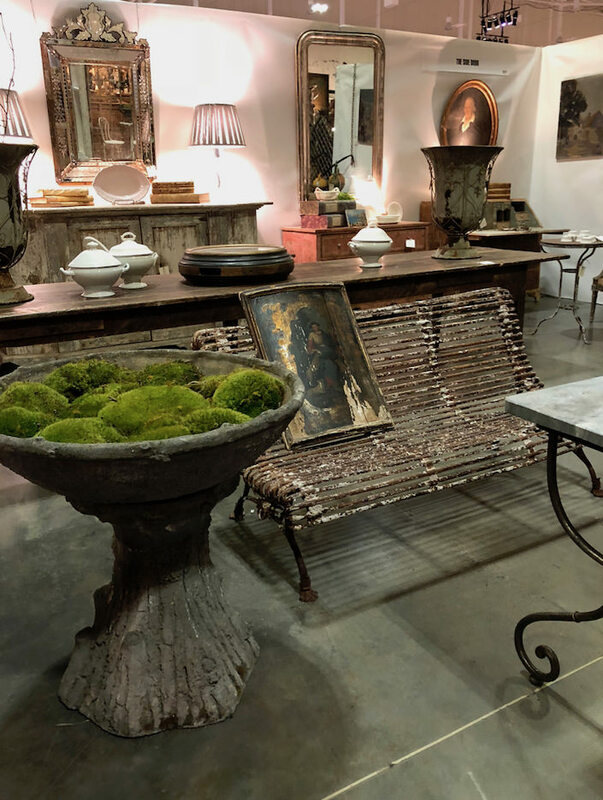 Cliff Leonard is a NYC area (South Salem, NY) favorite, who, while specializing in 18th and 19th century English & French antiques, always has a wide range of offerings. 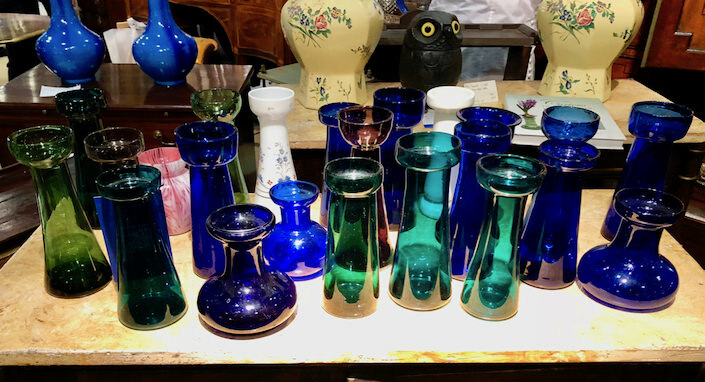 He had a great selection of bulb forcing vases in all the popular colors. 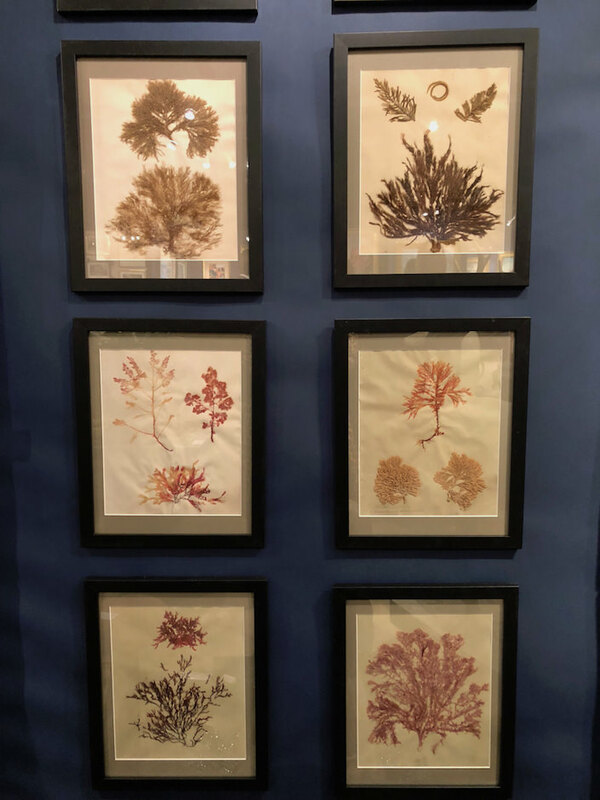 I was seriously tempted by this unassuming set of coral pressings at Withington and Company. I liked their unpretentious natural quality. 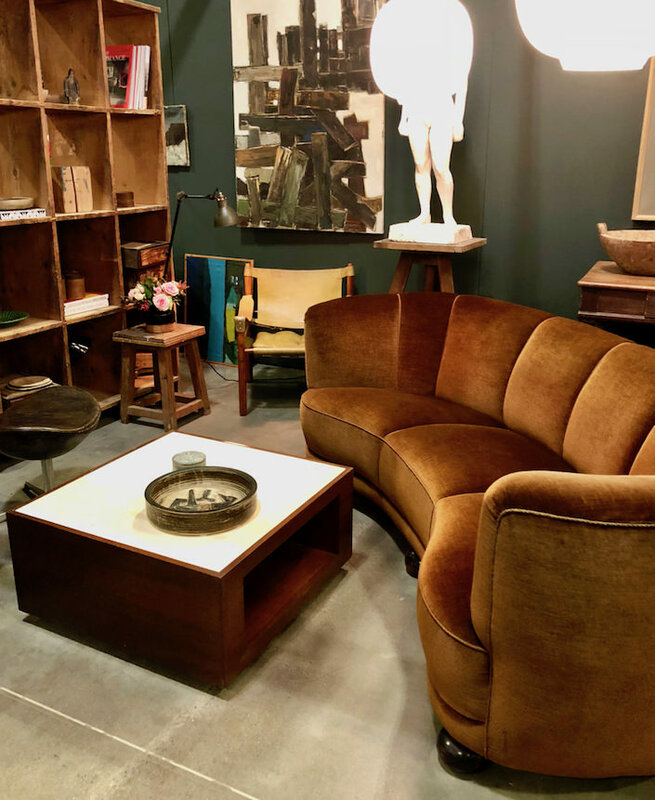 Nashville based Artifacts always has such great lighting and take note readers and design friends in Atlanta – I hear they are moving your way! 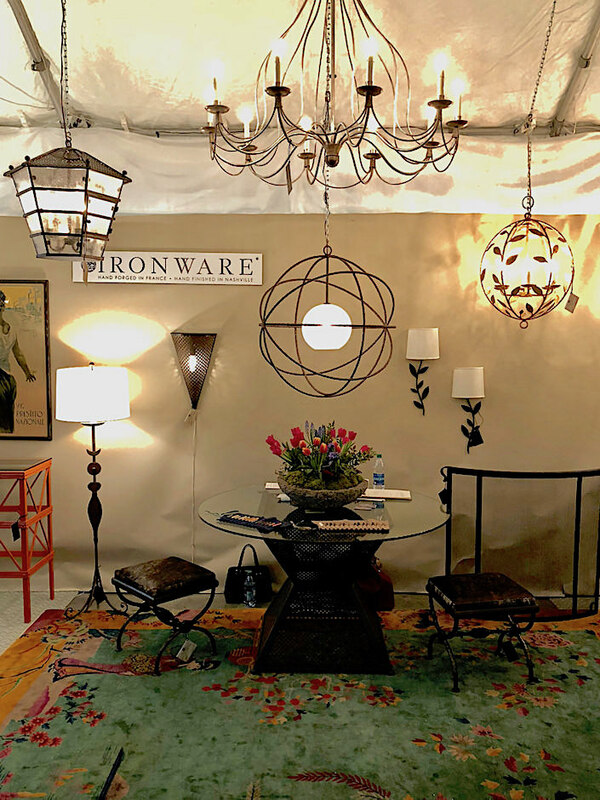 Karen Eaton of Ironware International was showing her artisanal pieces of lighting, furniture and accessories, using old world craftsmanship for today’s interiors. Consoles are such handy pieces and work in so many rooms. 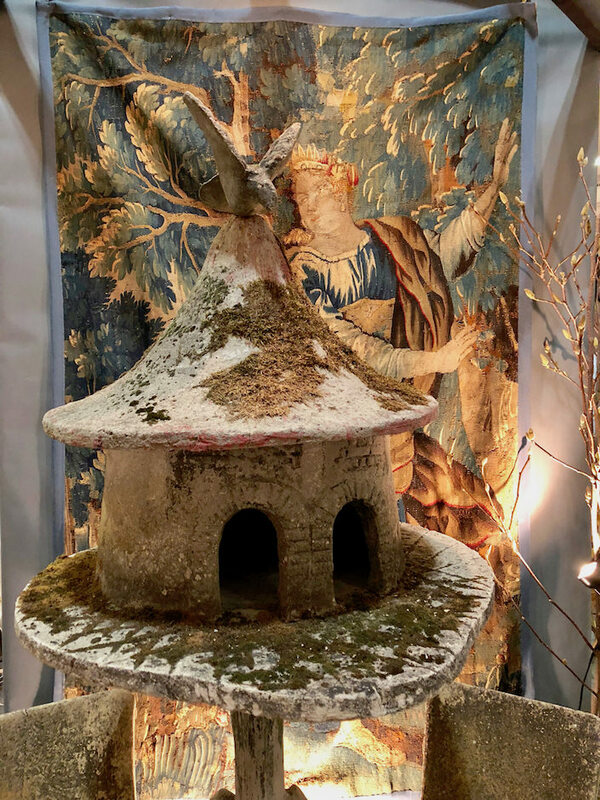 I liked this 19th c. Swedish painted one with griffon supports and faux painted top at Sherwood Antiques. 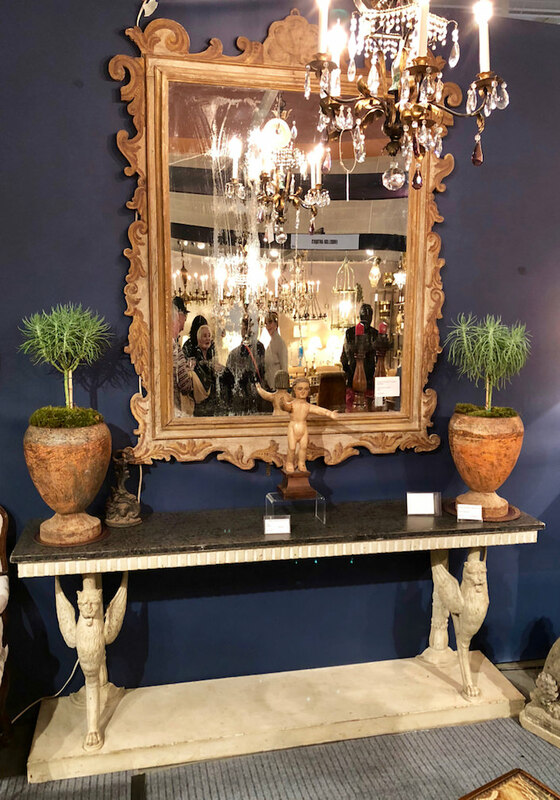 The large 19th c. painted Italian mirror above was appealing as well. 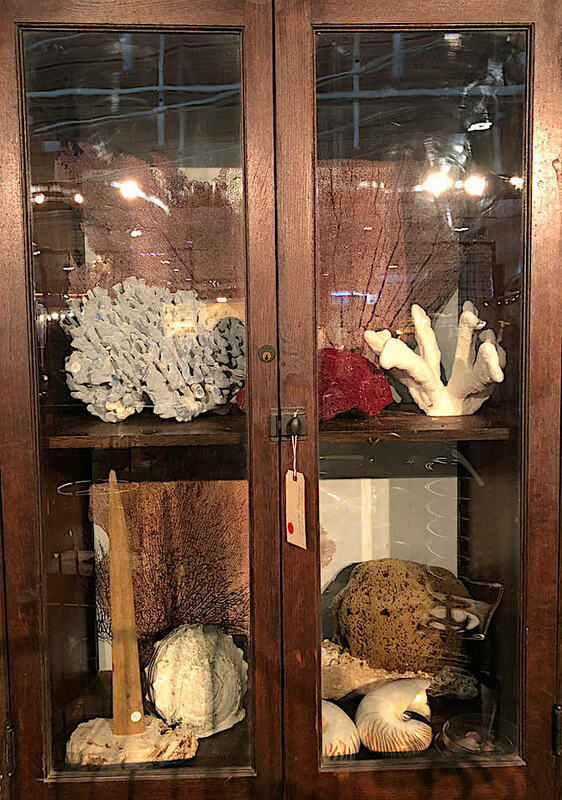 as well as vintage cabinets filled with natural curiosities. and the most beautiful floral arrangement at their entrance. The Side Door had some beautiful garden related antiques. 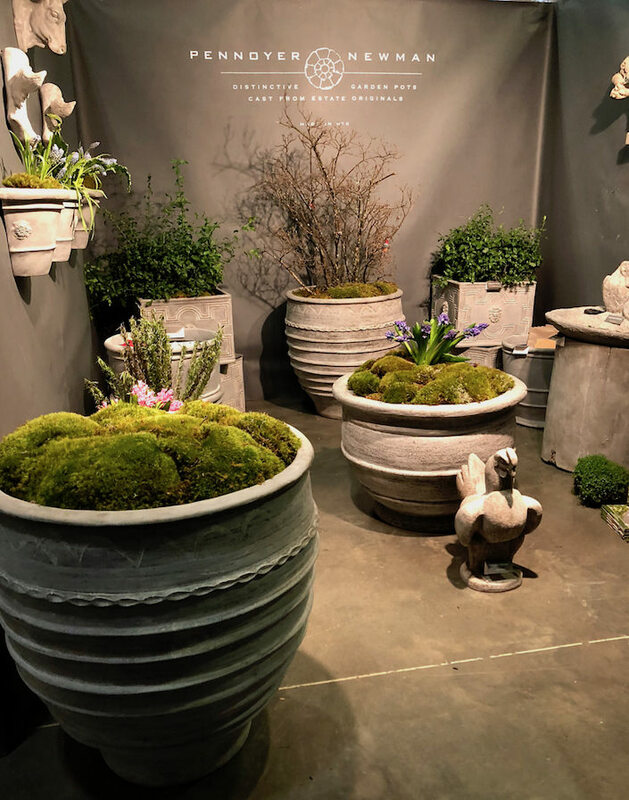 and long time fave Pennoyer Newman was there showing their gorgeous pots based on estate originals. 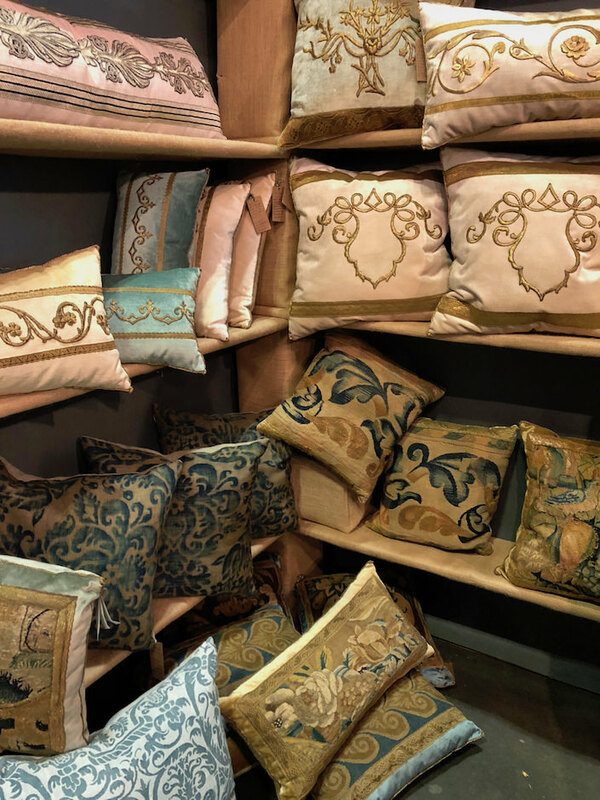 It was great to see friend Becky Vizard and her beautiful selection of antique textile pillows and accessories. Be sure to check out her Fortuny Canine Couture line and her book. Friend Mish Tworkowski was on hand opening night showing his exquisite botanically inspired jewelry. 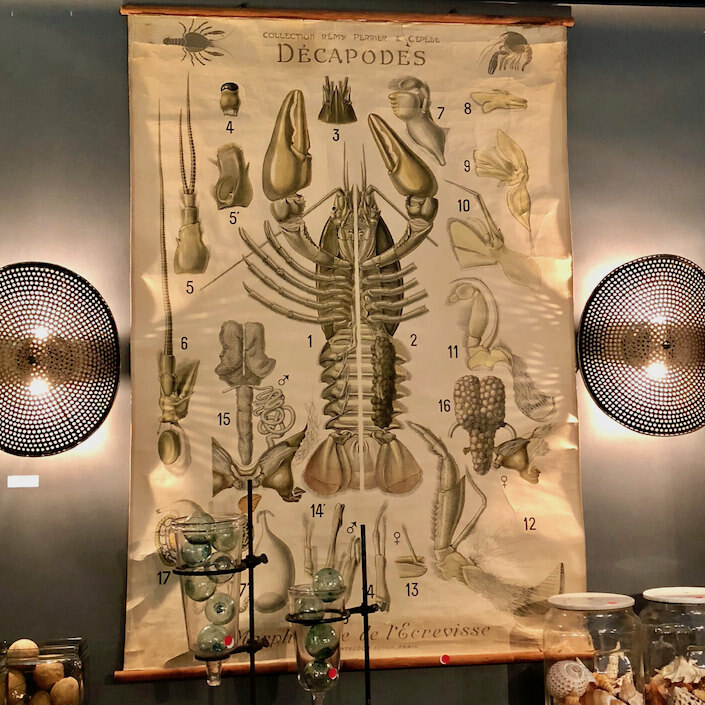 This was merely a few of the many treasures to be seen and perhaps acquired. For a live visit, you can join me and Susanna for a video tour from opening night. 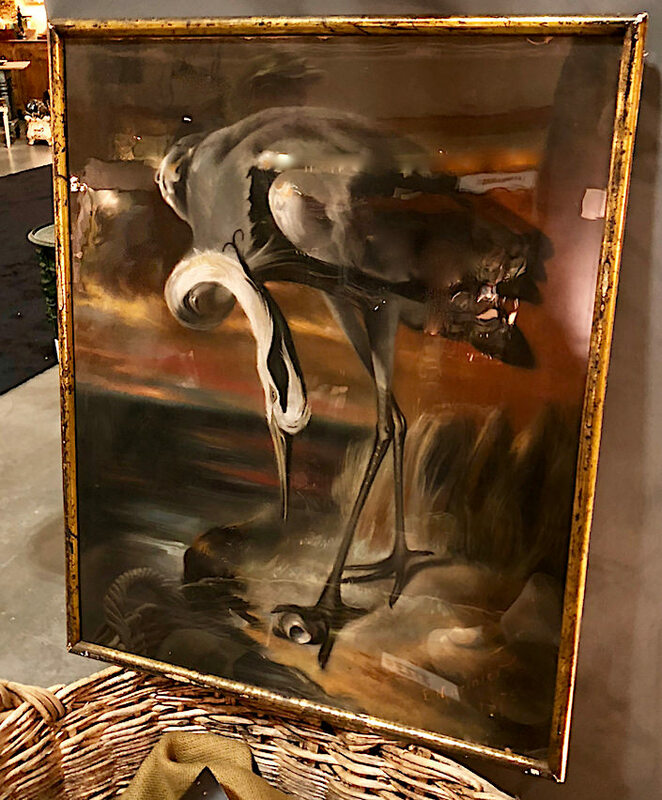 And if any of you were wondering, I did find something to bring home – this fabulous oil pastel of a giant crane with its original antique glass and frame but shhhh – it’s just going to mysteriously appear in my kitchen! This entry posted in art, design, furniture, garden, travel. 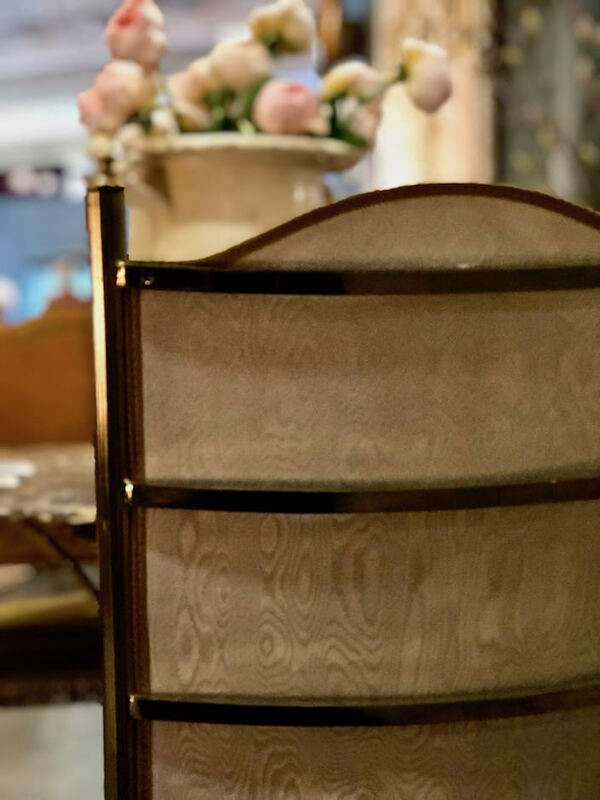 Entry Tags: antique show, antiques, Antiques & Garden Show Nashville, art, decorative arts, Nashville Bookmark the permalink. What a treat to time it perfectly to be in Nashville for this singular show. Excited about your purchase…how inspired to put that dramatically poised crane in the kitchen (shhhh)! What a great recap! Loved seeing you and the eye candy was extremely stimulating. This was truly an incredible show! with your beautiful crane!! And putting him/her in your kitchen, is brilliant! 80 queries in 0.595 seconds.